Theertha, co-founder of the startup ‘Sign NEXT’, wants to talk and communicate more effectively to the deaf people across the country and make them part of the mainstream conversation. 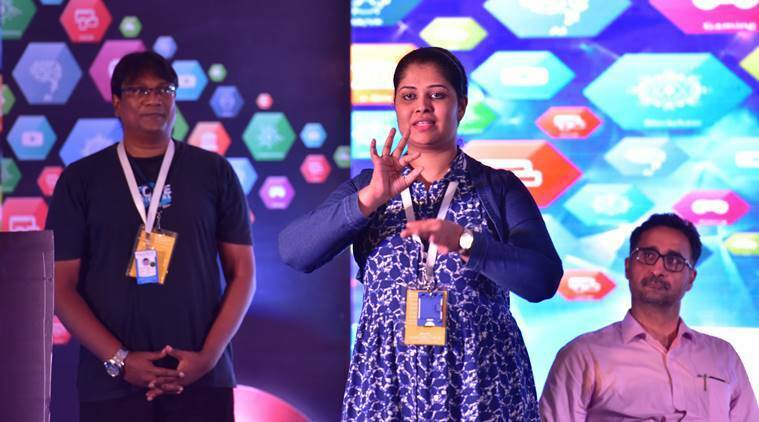 Through a sign language interpreter on the stage of the ‘Huddle Kerala’ startup conclave in Kovalam over the weekend, Theertha Nirmal spoke to an enamoured audience. “I have a dream. My aim is to educate and empower the deaf community through innovative technology,” she said. Theertha’s short address was received by thunderous applause. Co-founder of the startup ‘Sign NEXT’, Theertha, who has been speech and hearing impaired by birth, wants to talk and communicate more effectively to the deaf people across the country and make them part of the mainstream conversation. From nearly 50 startups which had pitched at the conclave, ‘Sign NEXT’ was among the final three which were shortlisted for attention by investors and industry leaders. Later, she spoke to indianexpress.com through an interpreter. “The platform gives us a huge opportunity to interact with the deaf community. I have always been self-confident. I have always had the self-belief that I can do anything,” she said. Even though Theertha went to a sign language school in the state, most of the teaching was through verbal communication and object identification. She said she especially struggled with English words as the teachers were not well equipped. It was after she completed her schooling and came to join the National Institute of Speech and Hearing (NISH) in Thiruvananthapuram for a B.Sc Computer Science course that she was able to hone her sign language skills. Through her husband, who’s also deaf, she came in contact with Kingsley David, who had experience working with hearing-impaired people at his firm in Technopark in the state capital. Now, together with Kingsley and a few others, Theertha has embarked on her journey of an entrepreneur, working patiently to understand the nitty-gritties of technology and making it practically usable for many from her community. “We are already incubated at Technopark and we have received the initial seed funding from the Kerala Startup Mission (KSM). We will come up with a mobile app through which educational modules, vocational courses, live streaming and video recordings in sign language will be offered to the deaf community. Basic stuff like how to appear for an interview, how to write an email and pregnancy-related information will be given out,” said Kingsley David. His target group is the estimated 3.5 lakh-strong hearing-impaired community in Kerala and the larger 1.8 crore people across the country who he claims don’t have technological access to basic educational material. “She’s (Theertha) going to be the one leading from the front. We will be at the back. She will be the actual evangelist for the startup,” he added.